The Korean traditional thoughts must be first examined in order to elucidate the ideological aspects of Tae kwon do as a traditional martial art. Ancestors of the Han (Korean) race experienced frustrations coming from natural disasters and existential restrictive circumstances of life and therefore they had to rely spiritually on the nature’s power, such as heaven, rain, cloud, sun, moon, trees, rocks, etc., for their consolation. As the tribal and agricultural community was firmly established, the Han people arrived at a unified thought, of “seon”(impeccable virtuousness) to become the basis of Koreans’ philosophical thought. On the basis of this thought and similar to karate in Japan, Buddhism and Confucianism reigned over the Korean people for such a long time that all individuals have been accustomed to devote themselves to the nation and society without falling into the victim of personal avarices, ever cultivating their mind and body. The Korean’s traditional thought is characterized by the priority on loyalty to the country and filial piety in people’s daily life, thus making people think about the responsibilities first before seeking any power. It also emphasizes the voluntary working for justice. 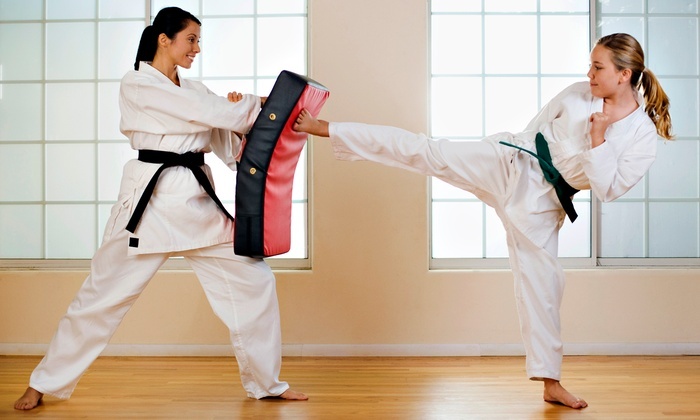 Tae kwon do certainly takes root in man’s instincts to survive by means of protecting himself from outside threat with the bare-hand fighting skills, and it was developed into a systematized martial art in the times of three-kingdom era. The three kingdoms, i.e., Silla(founded in B. C. 57), Koguryo(B.C. 37) and Paekje(B.C. 18), were all antagonistic among themselves in their respective hopes to achieve national unification on the Korean Peninsula. They had to defend themselves also from foreign aggressions from China or Japan. Under such circumstances, each kingdom tried to consolidate national unity first, stressing the spirit of national defense among the people. That spirit was based on the traditional “seon” philosophy and the warriors accepted it as a martial spirit. Above all, Silla’s hwarangdo (youth warrior’s corps) was a typical example of inheriting this spirit. Their firm view of the state was derived from the thought of loyalty and filial piety, with which they could voluntarily abandon their lives for the sake of national security. In addition, the courage of “no retreat from fighting” was also another virtue of that spirit. A third virtue was their practical thought of ethics, with which they pledged not to commit any ethical faults and never to betray their social obligations. After all, these spirits enabled the hwarangs of Silla to defend their kingdom and helped it conquer other two kingdoms, unifying the entire peninsula. Thus, the hwarangdo spirit inherited the Korean’s traditional thought based on the seon philosophy and gave birth to the Tae kwon do spirit consisting of the thought of loyalty and respecting one’s parents, courage, and practical ethical thought of consistency in learning and acting. This thought, shaped into an overall thought that emphasizes peacefulness, has been handed down to the present Koreans.